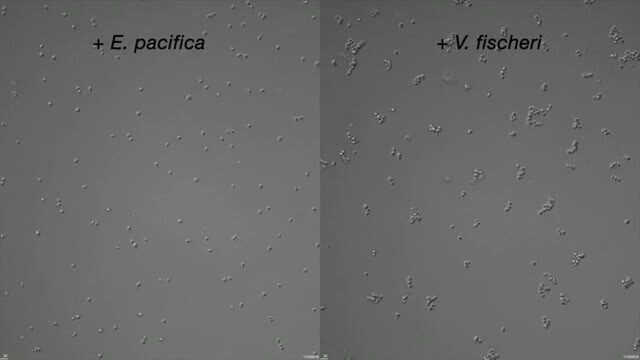 A mating swarm of the marine choanoflagellate S. rosetta, triggered by the bacterium V. fischeri. Tubulin is labeled gold, highlighting the cell body and flagellum, while the protein actin is labeled blue, showing off the organism's distinctive collar. Credit: Arielle Woznica and Nicole King, UC Berkeley. To the surprise of scientists, bacteria can act as an aphrodisiac for one-celled marine organisms notable for being the closest living relative of all animals. The organisms, protists called choanoflagellates, eat bacteria and serve as a source of food for small ocean animals like krill. Several years ago, the lab of UC Berkeley's Nicole King, a professor of molecular and cell biology and Howard Hughes Medical Institute investigator, discovered that certain bacteria make these one-celled choanoflagellates (a.k.a. choanos) develop into multicellular colonies. The new discovery, reported Aug. 31 in the journal Cell by King's lab and the lab of Jon Clardy at Harvard Medical School, suggests that choanos "eavesdrop" on bacteria to make sense of their environment and regulate their life history. "A lot of evolutionary theory favors the idea that mating happens when conditions are stressful, because you need to reshuffle the deck. With sexual reproduction, you will hopefully get a new combination of gene alleles that is more fit for whatever is coming down the pike," King said. On the other hand, King discovered five years ago that a different marine bacterium, Algoriphagus machipongonensis, makes S. rosetta form colonies reminiscent of an animal embryo. These multicellular colonies don't involve mating, but could help the organism more efficiently harvest bacterial food from the environment. "Bacteria are very good at integrating a lot of information about the environment, as different species of bacteria have different nutrient requirements. Choanos may be using bacteria as a proxy for environmental conditions, or live indicators for when its time to get ready for good or bad times," she said. 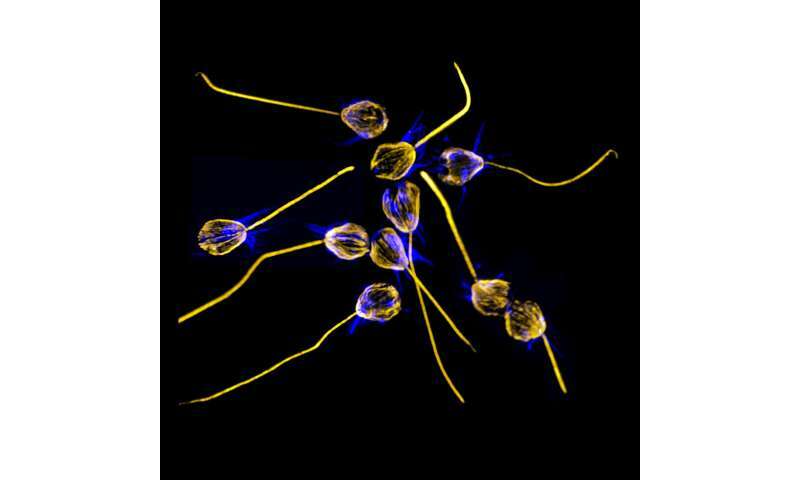 Though ubiquitous in the oceans, choanoflagellates are relatively mysterious—one reason that King has focused on them for more than a decade. In 2008, she was part of a team that sequenced the first genome of a choanoflagellate, Monosiga brevicollis, and in 2012 her lab discovered the bacteria that trigger multicellularity. Mating, however, was a mystery—even whether choanos engaged in sexual reproduction—until her team discovered in 2013 that starvation could trigger mating, although only a small percentage of cells would mate. The new study shows that Vibrio bacteria elicit a much more rapid response, with large percentages of cells mating within hours. "Choanoflagellates have a lot of flexibility in their life history. They can go on and on being asexual, but now we've found that they can also be sexual, and that the switch to sexuality is induced by a bacterial cue within an hour after exposure," says King. "One possibility is that these animals need particular cues from environmental bacteria that are not being provided in the lab," she said. After UC Berkeley graduate student Arielle Woznica discovered that these bacteria initiated swarming, they collaborated with Clardy's lab to track down the trigger: a protein constantly secreted by the bacteria, which they dubbed EroS. They showed that EroS is a chondroitinase, an enzyme that degrades a specific type of sulfated molecule found in the extracellular matrix of S. rosetta that was previously thought to be exclusive to animals. They also found that if this enzymatic function was inhibited, swarming did not occur, and that chondroitinases from other aquatic bacteria reproduced the aphrodisiacal effects. As the teams investigate how EroS works, they're continuing to explore the interactions between bacteria and choanoflagellates. As for implications for animals like humans and their bacterial partners, the so-called microbiome, King said that "we hope that by studying choanos, which are really simple, that we can identify key molecules and then go into the more complex environment of the gut microbiome, for instance, and see whether some of these molecules matter in that context as well." "I think by demonstrating a new type of bacteria-induced behavior, we may inspire others to look in the systems they study and see if they might have missed that bacteria play a role there as well," said co-first author Joseph Gerdt, a postdoctoral researcher at Harvard Medical School.